A 35 minutes drive away from the Ngurah Rai international airport, we arrived to this uncompromising and exclusive beachfront resort offers a vast Indian Ocean views encompassing Nusa Penida Island and Mount Agung. Anapuri Villas, an exclusive resort even unknown by many locals is a resort within a resort that is an alluring diversion from modern life, with an ultimate beachfront location. Right next to a local small Balinese village, the concept of the resort gives you the experience of life in private, unspoiled yet unknown Bali, while enjoying every comfort and luxury it is possible to provide. The resort is designed to encourage you to just be staying and in fact living in the resort by witnessing the breathtaking scenery and the life of the villagers at the beach, in their fishing boats, or in the rice padi fields. This exclusive and luxury home away from home resort, right next door to the beach side precinct of Sanur, Anapuri Villas has a total of four villas: a 6 King Suites + 2 bedrooms Puri Salila Beachfront Villa, a 4 bedroom Puri Awani Beachfrot Villa, a 3 bedroom Puri Sannti private villa and a 1 bedroom Puri Kamadewa Super King Villa. This alternative villa concept is a resort within a resort although every singular villa can be rented individually or more to accommodate smaller and larger events. Each villa has the complete facilities and its own service team together with a personal in-villa butler to look after every your every need. In other words, that means you can also choose to discuss your daily arrangements for your meals requirement as to where and when you like to have you cook-to-order meals within your own villa kitchen and other outdoor activities with your dedicated in-villa butler and in-villa chef. Hence, there will be no strangers sharing the same experience as you do. This unique tailor-made concept offers a complete privacy and exclusivity with activities going around within your very own villa. Our One Bedroom Super King Private Villa Puri Kamdewa exudes passion, warmth and luxury. It is an ideal honeymoon villa as we were molly-coddled by the our private butler and chef as if every day is a special occasion. The bedroom and en-suite is upstairs with an outdoor sitting room and Jacuzzi looking directly to the Indian ocean. 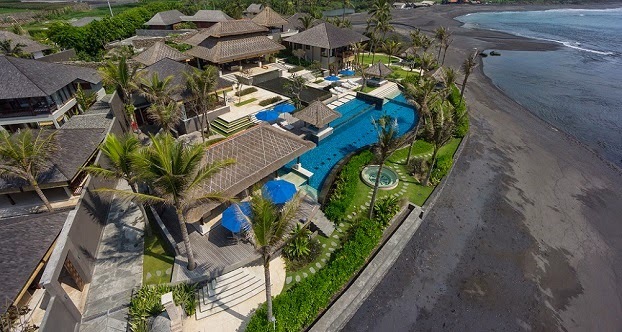 This lavish one bedroom super King-Sized beachfront villa epitomizes decadent living from shaded private walkways to a view of mystical Mount Agung. Downstairs Pavilion provides plenty of sitting and resting areas as well as a beachfront garden/pool bale. Sun lounges are places almost everywhere for your need to suit your mood with different views. Perched over a private infinity pool and small onsen, this beachfront oasis is an intimate residence for a secluded escape. A office/media TV room are powered by a android tablet system for your preferred choice of entertainment, movie and music throughout the villa loaded with over a thousand movies and assorted styles of music and TV channels to choose from. The dining tables comfortably sits four people adjacent to the well equipped opened bar as well as a fully equipped kitchen. There is all what a luxury private home living has making you feel extremely comfortable and relaxed. The two-level villa allows you to sequester yourself away from the service staff should you want to relax in absolute privacy. They are always very discreet and are out of sight outside of scheduled meal periods and other needs, but always at your fingertips when you need them. There are also those extra touches that set Anapuri Villas apart from so many other luxury resorts’ offerings in Bali. The suggested menu offerings and wine lists are very extensive and surprisingly extremely affordable in such hospitality style. 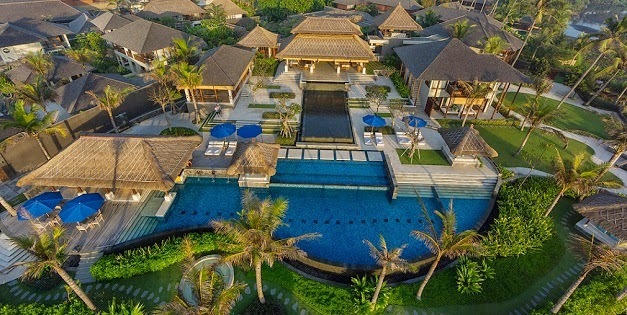 An eclectic mix of Asian and Western cuisine is served in the villas, having your own personal butler and chef makes the catering arrangements extra special, you really don’t feel the need to leave the environs of your villa (except perhaps for a lazy walk along the soft black sand beach). Specializing in elite service, we tried quite an array of different dishes over breakfast, lunch and dinner. The chef’s skills and the food presentation had never failed us, Soto Ayam, BBQ Pork Ribs, Beef Rendang and The Grilled Garlic Prawns were memorable and absolute authentic flavored food. There are other Western and Mediterranean choice yet the Asian menu is always on the top of our list while in the South East Asia region. Ingredients are obtained from the local supplies to ensure the freshest on request together with the resort on-site organic gardens for sustainable local development. The culinary skill of the chef is equal to some of the highly recommended restaurants in Bali. Each meal are carefully made-to-order to suits your palette and there is always something there to enjoy for such a treat. To ensure there is some extra pampering, the resort also houses the Anapuri Spa. This luxury massage and beauty spa is a sanctuary of tranquility. It offers every indulgence and rejuvenation spa lovers have come to expect and more. There are eclectic range of pampering, reviving and relaxing therapies and a signature product range (all natural ingredients of course) that is designed to enhance your sensory experience inspired by Balinese healers and age-old traditional beauty rituals through its signature brands and therapeutic techniques, be it during a therapeutic Balinese massage or a hair hydrating crème bath. Additionally, as the resort caters to very private and exclusive weddings, the spa has a fully equipped salon to meet every bridal party need. The Anapuri Beauty Salon offers a luxurious twist on personal beauty services from scalp massages to nail care services pampering treatments. We chose to experience a signature massage and this provided a welcome respite from our daily villa indulgence. Anapuri Beach Villas offers a truly tailored luxury experience that has left us feeling very special. We never tired of the confines of our villa, save for a leisurely walk on the beach, as we chose this leg of our getaway to soak up the sounds of Pabean Beach and let the villa staff pamper us. When the fire bowl is lit in the evening, it switches to a different mood while the ocean tides hits the shore. With the romance of the stars brightening up the darkest night, relaxing background jazz music plays, you may begin to wonder the champagne could be your next best company or you prefer a Bali-Hai cocktail to unwind your peaceful evening. We want more!